Automakers are lining up to flood the market with a litany of new electric vehicles, but as many in the industry know, the currently tiny EV market isn’t going to grow without a serious boom in fast charging infrastructure. But it might be an easier problem to solve than most think. It’s a weird conundrum: if carmakers want to succeed in attracting new EV buyers, there needs to be fast charging infrastructure in place. But carmakers make cars, and aren’t keen on building infrastructure themselves. So far, Tesla’s the only one to really tackle the problem by developing its Supercharger network at a rapid clip over the last few years. But that’s something that’ll change as more EVs hit the road, said Pasquale Romano, chief executive officer of ChargePoint, the largest charging network for electric vehicles. Ahead of CES this week, the company announced that it integrated Amazon’s Alexa for its home charging suite that allows someone to start and stop charging using the virtual assistant. ChargePoint says it has more than 43,000 charging spots, along with 655 Express DC fast charging spots. As Romano put it, most drivers at the moment do the majority of their charging at home or at work. The obvious issue, he said, is the gap in fast-charging highway stations, a question he says he gets “every time” in interviews as of late. What’s key, Romano said, isn’t plopping down as many supercharging stations as possible. There needs to be a network that’s plotted smartly along all major highway routes in the U.S. and, ideally, places stations about 75 miles apart from one another. Romano believes you could cover most of the U.S. with 400 fast charging sites and then scale from there, similar to how the Supercharger network progressed in recent years. “It’s not that intractable,” he said. “Four hundred isn’t a big number.” And even for a site in, say, Wyoming that doesn’t get used often, it needs to be there, Romano said. Romano also argued that the key issue all boils down to how automakers are going to persuade newcomers to give electric cars a chance, which is an odd position for someone on the infrastructure side of the EV conundrum to take. Romano said that social acceptance of EVs can be accomplished essentially by word-of-mouth; someone in an office buys an electric car, shares the—hypothetically enjoyable—experience of owning an EV with a colleague and, voila, you have a newly interested fan of electrification. 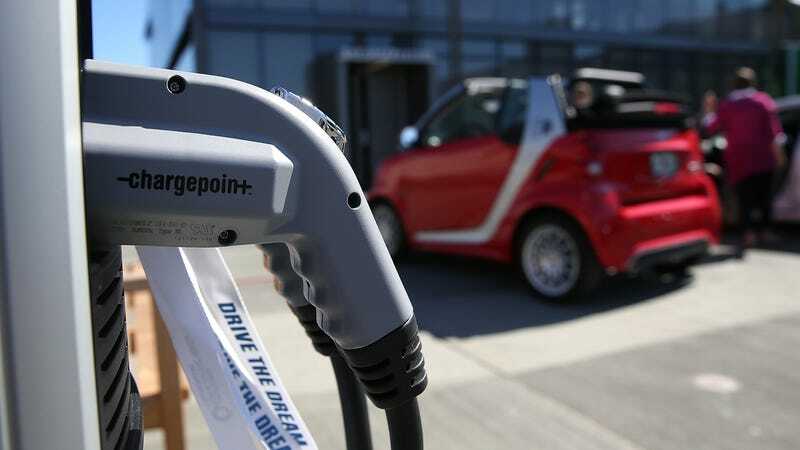 The various connector standards for EVs presents another issue for charging infrastructure, which perhaps could be addressed by Tesla opening up its Supercharger network. But Romano doesn’t see that happening. The Supercharger cables, for one thing, are short. They simply couldn’t reach a different EV with a charging port situated at the front of a vehicle. So instead of tackling a massive project of retrofitting Tesla’s Supercharger network, it makes more sense to just build out new stops, Romano said. Scott Mercer, CEO of EV charging network Volta, said the infrastructure planning requires a delicate balancing act. Most EV buyers aren’t going to take the long road trips they may be thinking about before purchasing a vehicle, he said. So, he said, the focus should be building chargers where there’s higher demand in closer locations. Volta operates about 400 free public electric car charging spots that are paid for by using sponsors. For CES, the company announced Tuesday that it partnered with a company called Hubject that connects drivers to a large network of interoperable charging ports. “You need to concentrate fast charging infrastructure along the routes and access points where there are fleets of people,” he said, rather than load up highways with a charging station every 10 miles. Drivers may want to buy an EV and have the capability to cruise hundreds of miles in it with ease, but there’s a utility aspect that needs to be considered as well, Mercer said. “What convinces someone to buy an EV is very different than what kind of charging infrastructure they will use once they have that car,” he said. Putting it into perspective—really, how many motorists make a long road trip per year, anyway—it seems like a far-easier goal to attain than the general consensus lets on. When you put it in context, 400 sites across the entire U.S. seems entirely plausible and achievable. All told, Pasquale and Mercer see it from a more optimistic standpoint, which makes sense—it is, after all, what they’re in the business of selling.